Back in November, an elderly women stopped by Shish restaurant, located in southeast London, to ask for a simple favor. She was struggling to close a window at her nearby home, and wondered if someone at Shish might lend a hand. The staff members quickly obliged, and she returned the following day to thank them for their generosity. She hadn’t known who else to ask for help, since she lived alone — and she would be alone for Christmas, too, she told them. The restaurant’s owner, a Turkish Muslim man named Serdar Kigili, was touched. He was reminded of his mother, whom he hasn’t seen for five years because she lives in Turkey. He and his team decided to do something bigger to support the elderly and others who might otherwise be forced to spend the upcoming holiday season without their loved ones around. They announced that Shish would serve a free three-course meal on Christmas for senior citizens and the homeless. 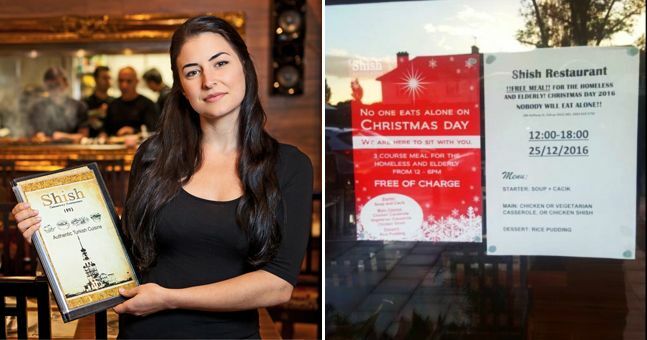 Signs have been taped in the restaurant’s front windows to advertise the promotion, explaining in a hand-written invitation, “No one eats alone on a Christmas Day! We are here to sit with you.” Shish has posted and reposted photographs of the posters on their Facebook and Twitter pages, hoping followers will spread the word. The initial Facebook post has now over 1,200 likes and 3,500 shares, with multiple people offering to volunteer for extra assistance or even to provide rides to the restaurant. Shish’s food is inherently cross-cultural and inclusive. As the website explains, “We come from the tradition of where many cultures are embraced from different cuisines under the one roof of Ottomans. What we provide is the combination of all those different cuisines blended in one with great taste and flavor.” The three-course meal on the 25th will include satisfying staple dishes: soup and cacik (a yogurt dip) as appetizers; a choice of chicken shish, chicken casserole, or vegetarian casserole as a main dish, and rice pudding for dessert.